Our Chicken Tortellini Soup is loaded with chunks of chicken, tortellini, rich broth, and tender vegetables. It’s comforting, delicious and filled with some tasty surprise flavors. Not your average chicken and noodle soup! 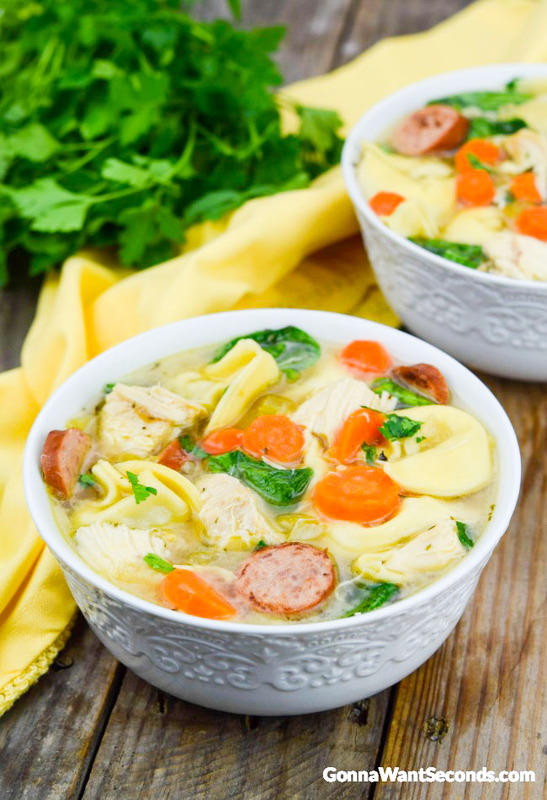 Chicken Tortellini Soup, a variation of good old Chicken Noodle Soup, is as versatile as it is hearty and healthy. With a few quick tweaks, it’s easily transformed into a creamer soup or one of Italian vintage. 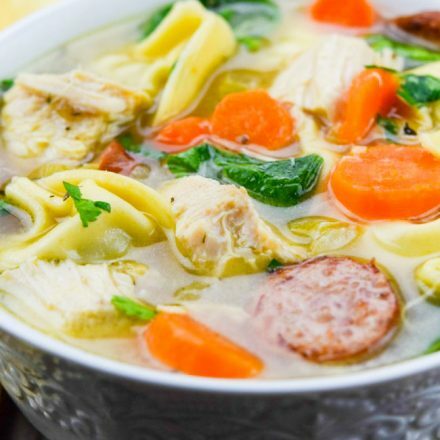 You can also create a unique Chicken Tortellini Soup by adding different vegetables to create new textures and flavors! Speaking of the plant kingdom: those among you who are trying to transition your family to a healthier diet have found the right recipe. 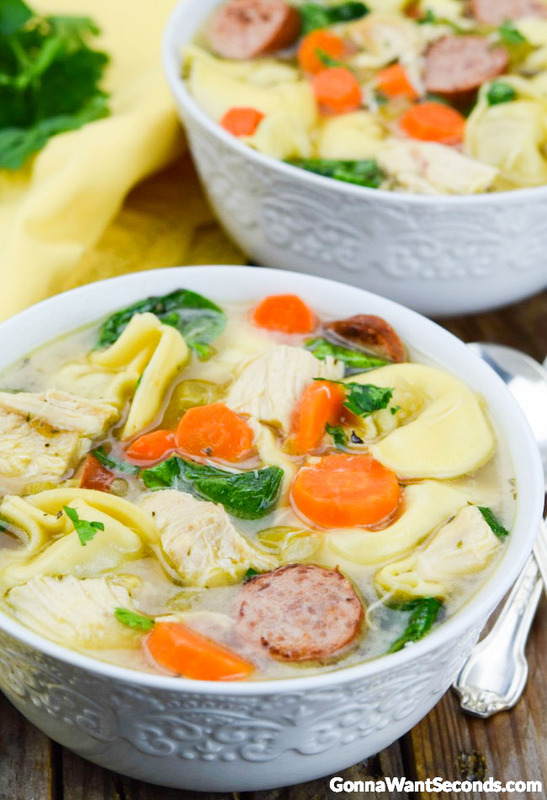 In Chicken Tortellini Soup spinach, carrots, and celery provide a hearty serving of fresh vegetables. The Old Farmer’s Almanac has a helpful list of vegetables and their benefits for your reference if you are aiming to maximize any specific vitamins or minerals. Once your family is hooked on this recipe for tortellini soup, you might want to try my Chicken and Rice Soup (my favorite comfort soup), my EASY Crock Pot Chicken Noodle Soup, or my Creamy Chicken And Wild Rice Soup. Keep reading for a handful of tips and tricks that will help you whip up a fabulous dinner tonight. Every spoonful is Loaded with Yummy Goodies. It’s my go-to when I want Chicken Noodle Soup with a little something more!! 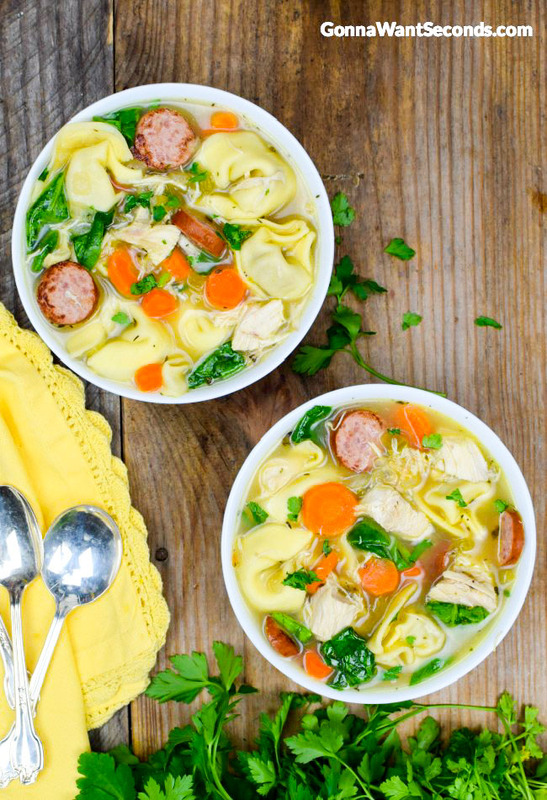 What Ingredients Do You Need To Make Chicken Tortellini Soup? The bevy of seasoning in this soup stems from a few tablespoons of olive oil, yellow onion, several cloves of minced garlic, salt, black pepper, red pepper flakes, dried thyme leaves, bay leaves, low sodium chicken broth, and chicken flavored Better than Bouillon. For veggies, you will need chopped carrots, celery, and fresh baby spinach. The meat in my recipe consists of sliced smoked kielbasa and chopped cooked chicken. Finally two packages of tortellini! You may choose to garnish the dish with some chopped Italian parsley. How Do You Make Chicken Tortellini Soup? This Chicken Tortillini Soup recipe is made in six easy steps. First, you brown the kielbasa. Next, you sauté the vegetables (excluding the spinach) with some seasoning. Then, the products of the first two steps are simmered in chicken broth with the remaining flavor additives. At this point, the hard work is over! All that’s left is simmering the chicken and tortellini, adding the spinach, and serving with a little garnish. This makes your Chicken Tortellini Soup food network worthy! Our Chicken Tortellini Soup is loaded with chunks of chicken, tortellini, rich broth, and tender vegetables. It's comforting, delicious and filled with some tasty surprise flavors. Not your average chicken and noodle soup! Heat olive oil in a large stockpot, over medium heat, until it begins to shimmer. Add Kielbasa and brown. Remove to a paper towel-lined plate and set aside. Add remaining 2 tablespoons of olive oil to the stockpot and heat over medium heat, until it begins to shimmer. Add onion, garlic, carrots, celery, 1/2 teaspoon salt, black pepper, red pepper flakes, and thyme. Saute, stirring frequently, until the vegetables are softened but not browned, about 6-7 minutes. Add the sausage back to the stockpot. Add in the chicken broth, bay leaves, and Better than Bouillion. Bring to a boil, reduce heat and simmer 20 minutes. Add the chicken, tortellini and simmer just until pasta is al dente, about 5 minutes. Stir in the baby spinach. Ladle into bowl and garnish with parsley and serve. Place 3 boneless chicken breasts in a single layer in a saucepan. Pour in enough water to cover them by 1 inch. Add 2 teaspoons salt. Bring the water to a boil over medium heat. As soon as the water boils, cover the pan with a tight-fitting lid, and turn off the heat completely. Allow the chicken to sit in the liquid undisturbed (don’t lift the lid or you’ll ruin the magic) for 18-20 minutes, depending on the thickness of the chicken. After 18-20 minutes, check for doneness. Chicken is done when the thickest part registers 165 degrees with an instant thermometer. Tortellini: Experiment with the tortellini to make this recipe even more versatile. You can use any flavor you like – spinach, chicken, cheese, or even mushroom. If you have specific dietary restrictions, you can also find gluten-free and dairy-free options. General: A note about leftovers – The chicken spinach tortellini soup will thicken if it sits any length of time, so have extra broth available to thin the dish if you’re making it early in the day or planning on leftovers (Better than Bouillon comes in handy here). Crockpot: Crockpot chicken tortellini soup comes together in a breeze! If you’re really strapped for time, the dish can come together in a crockpot while you manage the daily chaos. To create a slow cooker cheese tortellini soup, simply brown the sausage and sauté the aromatic veggies as the recipe directs, then put everything except the pasta and spinach into the slow cooker for 3 hours on high or 6 hours on low. Add the tortellini and spinach about 18 to 20 minutes before you’re ready to serve (the slow cooker should be on high for this part) to make sure the pasta retains that al-dente texture. Better Than Bouillon: If you’re a regular reader here, you know I often recommend using Better Than Bouillon in my recipes. It’s simply a quick and flavorful alternative to making your own stock and/or an easy way to improve the flavor of a store-bought broth or stock. I LOVE homemade chicken stock, but let’s face it, it’s not something I always have time for. Especially for a weeknight meal. It’s easy to adjust the intensity by mixing in a little more or less based on your preferences. When Cook’s Illustrated agrees with you, you can’t be wrong! Aromatics: Do I need to sauté the vegetables? Yes. Subtle layers of flavor are the hallmark of a good soup or stew, and those only evolve when the ingredients are brought together in just the right way. Skipping this step can mean underdeveloped flavors and even undercooked vegetables. More Soup Recipes! Creamy Chicken Tortellini Soup Recipe: For a richer, milkier version of this dish, stir in a cup of cream! This is a good way to transform it from a fall favorite to a mid-winter delicacy. 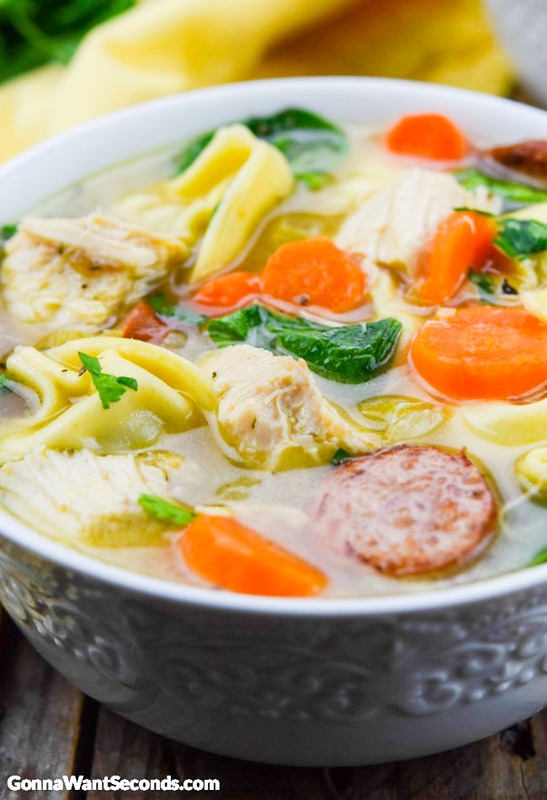 Chicken Tortellini Soup with Tomatoes: For an Italian Chicken Tortellini Soup variation, add some diced fresh tomatoes to the mix (canned tomatoes will also work), and try a spicy Italian sausage instead of the kielbasa. If you need a little help choosing the sausage substitute, the National Hot Dog and Sausage Council (who knew, right?) provides a lovely list of sausage varieties on their website. How Do You Make Chicken Tortellini Soup In The Slow Cooker? Slow Cooker Chicken Tortellini Soup is made in three easy stages. You will need to brown the sausage and sauté the veggies as instructed in the original recipe. Next, put everything except the spinach and tortellini into the crock pot. Cook for about 6 hours on low, or 3 hours on high. Twenty minutes before serving, turn the heat to ‘high’ if it is not there already, and add the spinach and pasta. Can You Make Chicken Tortellini Soup Ahead Of Time? Yes, and no… It can be partially completed well in advance (see below), or totally completed a few days in advance. It will keep in the fridge for 3 to 5 days. You can also plan to prepare the dish over the course of 6 hours by making Chicken Tortellini Soup slow cooker style! It is important to note that the soup will thicken as it sits, so if you are preparing it in advance, keep some chicken broth on hand to add before serving. Can You Freeze Chicken Tortellini Soup? I would advise against putting the completed dish in the freezer. Upon reheating, the carrots and tortellini will become mushy, and the chicken might get too tough with the additional cook time. What you can do, however, is set aside these three ingredients, and freeze the remainder of the soup in an airtight container. Then, as you are reheating the frozen soup to serve, add the carrots, chicken, and tortellini! Note: you may want to lightly sauté the carrots before adding them in order to achieve the original flavor. What Do You Serve With Chicken Tortellini Soup? Any kind of crusty bread makes an excellent companion to this soup. Other common pairings are grilled cheese, roasted veggies, and winter salads. If you want to try something off the beaten path, Slovak bobalki is a nice compliment to the Polish sausage used in the soup and makes for a sweet side to serve with the savory dish. Crock Pot Chicken Noodle Soup -This easy, healthy, Soup takes just a few minutes of prep time and makes a delicious, rich soup loaded with goodies! Matzo Ball Soup – Light and fluffy Matzo balls floating in a rich and savory chicken broth loaded with carrots, celery, and chunks of chicken! Vegetable Beef Soup– This Hearty, Old Fashioned Vegetable Beef Soup has an incredibly rich broth and is loaded with tender chunks of beef and all the right veggies! Easy Potato Soup– This delicious Easy Potato Soup is comfort food at its Best! Super quick and easy to make. It’s like a warm hug from Grandma in a bowl! Hamburger Soup – is a home-style, hearty meal sure to satisfy healthy appetites and stir up happy memories of Grandma’s house. Or, for something totally different, check out this low carb version of chicken noodle soup!